When Miss Bates needs to restore her faith in the romance genre, she’ll read Lynne Graham. First, her buddy over at Shallowreader loves Graham and that’s an ironclad rec and Miss Bates’ last (and first!) Graham read resulted in a precious keeper of delight. Delight is key to Graham’s accomplishment: she delights Miss Bates, surprises her, makes her smile, and upends her moues of romance-reading disapproval. Graham’s latest, The Billionaire’s Bridal Bargain, vies with Morgan’s Playing By the Greek’s Rules as HP extraordinaire this year! Damn, but these two ladies can write romance. They can write it because they love it, believe in the story it has to tell of two people finding understanding and recognition of their essential selves in the other. But, the romance narrative’s thematic gravitas is couched in the garments of delight. Graham’s The Billionaire’s Bridal Bargain is the contemporary marriage-of-convenience romance between billionaire Cesare Sabatino and Yorkshire farmer Lizzie Whittaker. As Miss Bates said in a recent review, contemporary marriage-of-convenience is hard to pull off, as evidenced by Celmer’s failure. Celmer’s More Than A Convenient Bride strives for verisimilitude … ack, wrong, realized Miss Bates when she read Graham’s Bridal Bargain. For contemporary marriage-of-convenience to work, it is best left to the fantasy-ridden HP, where the reader expects billionaires, babies, and make-overs … what’s a little MoC to that? She blinked in fleeting bewilderment and then headed towards Cesare in a sudden movement, rage boiling up through the cracks of anxiety and concern for her dog and her flock. “You’re the bloody idiot who let a helicopter land in a field full of stock?” she raked at him incredulously. In all his life, nobody had ever addressed Cesare with such insolence. A faint frown line etched between his ebony brows, he stared at her as if he couldn’t quite believe his ears. Indeed he was much more concerned with the reality that, in spite of her awareness of his visit, he bride-to-be still looked as though she has strayed in from a hostel for the homeless. A streak of dirt marred one cheekbone and her clothes were caked in mud and displaying damp patches. But when he glanced higher and saw the luminous colour in her cheeks that accentuated her hazel-green eyes and the contrast of that tumbling mane of admittedly messy white-blonde hair, he registered in some astonishment that even had she been wearing a bin liner it would not have dampened her physical appeal on his terms. His usual high standards, it seemed, were slipping. “What’s the problem?” Cesare enquired with perfect cool, reasoning that some sort of cultural misunderstanding could have provoked her sudden aggressive outburst. “Don’t shout at me,” Cesare sliced in softly. “I am not hard of hearing.” [Later, as Cesare sits in an ancient Land Rover holding the injured Archie, Lizzie driving with frightening kamikaze manoeuvres, he thinks] … he had been sent to Yorkshire to suffer. Other than the sheer fun and funni-ness of the scene, it sets up the hero’s fall for the heroine. Graham’s heroines are wonderful in their kindness and sangfroid, their love for animals and everything weak and vulnerable. Their other quality is a certain innocent self-possession (the only equivalent Miss Bates can think of is some early Garwood historicals). The beauty of this scene also lies in the hero’s befuddlement; it stands in for how the heroine will rock/change his world: with his attraction to her, yes, but in turn, by introducing him to the joys of love. The hero’s capacity is incipient in him, witness his eventual care for the dog as he careens in the jalopy on the way to the vet, but it needs the heroine to bring it out in him. The yelling on her part is utterly charming: Miss Bates loved it. It proved the heroine’s indifference to the hero’s power, money, influence, and sheer size, Tweety to his Sylvester. Though in comic mode, Cesare’s “suffering” is the means to his transformation. An introvert, whose primary way of understanding the world is what he prides as logic and reason, will confront love’s illogic as embodied in Lizzie … and Archie. Graham continues in this marvelous vein: Lizzie’s defiant stance for love debating Cesare’s attempt to assert reason. Cesare’s initial comic realization of his Yorkshirean “suffering” is his encounter with the heart he’s ignored, a heart eventually beating with love for Lizzie and Archie. Lizzie and Cesare’s journey to love, understanding, companionship, and family is wonderful. Cesare’s “suffering” along the way (including a hilarious drunk Lizzie scene and Machiavellian strategizing for Lizzie’s attention and love involving Archie and roast chicken) is what makes this romance narrative. Miss Austen says “there is no charm equal to tenderness of heart,” Emma. 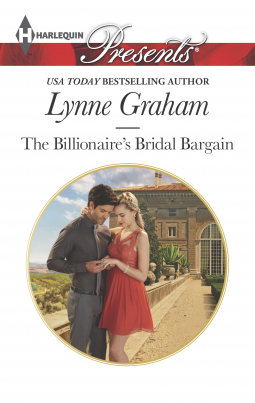 Lynne Graham’s The Billionaire’s Bridal Bargain was released, by Harlequin, on March 17th, and is still there, waiting for you, in “e” and paper, at your preferred vendors. Miss Bates is grateful to Harlequin for an e-ARC, via Netgalley. This sounds great. I’m definitely going to read this one. Thanks! It’s a sheer delight: I hope you enjoy it! Adding to Mt. TBR. I mean how can I resist after the Tweety & Sylvester reference? 🙂 Plus this is an HP writer I’ve wanted to try and it sounds like a good place to start a potential glom. I do love that you refer to the “fantasy-ridden HP” and their “otherworldly” sense. I actually think that HPs are the best (and perhaps the only regular) form of absurdist fiction being written. Yes, I was tickled pink we used the same quote … That is a great insight about absurdist fiction, under-appreciated absurbist fiction that can be read on so many levels. I think some of Betty Neels’ heroines hit this note too. I’ve just read the sequel to this one (featuring Lizzie’s younger sister). It’s a sheikh and secret babies and Big Mis story which I didn’t like as much.